Long Valance Set. wide by 14 in. Tier Set together 54 in. wide by 36 in. Easy Care: Machine Washable - See care label. Update the appearance of your kitchen with Apple Orchard Kitchen Curtain set. It's a great touch to your kitchen's decor. The design and texture of the kitchen curtain is delightful. Bring in an open and airy feel into your kitchen with this Kitchen Curtain. Listing is for 1 handmade valance. Modern Floral,red, black, gray, white cotton print. Measurements 41" wide by 12" long....1 1/2" rod pocket. Fits up to 30"..unlined. Free fabric samples colors may vary on your monitor. Special orders, custom orders and quantity orders available contact seller for more details. If listing has ended or out of stock contact seller for a reserve order. 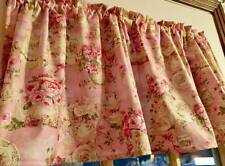 Come check out my ebay store for more styles and colors of valances. Read full listing for more details!. 1 Pair Bronze Grommet Lined Room Darkening Blackout Window Curtain Set 63" 84"
Listing is for 1 handmade valance. Jacobean floral in red. white, gray, and black. Cotton duck decorator cloth. 41" wide and 11 1/2" long, 1 1/2" rod pocket, covers 30" of rod space, unlined. Come visit my store for more styles and colors of valances. Read the full listing for more detail. 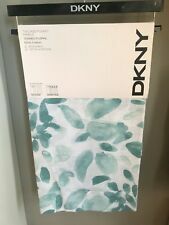 1 Pair Room Darkening Floral Design Blackout Window Short Curtain Panel DR#2 36"
4 Piece Kids Window Panels Set Beautiful and Complete Kids Window Panels Set with Matching Tie Backs is the Perfect Addition to Any Kids Room. Tumble Dry Low. Gentle Cycle. Machine Wash in Cold Water. You will recieve one valance. 13" long by 41" wide. This includes a 1 1/2" rod pocket and a 1" top header. This valance fits a 1" white curtain rod. If you want a full look to your valance on your window you always want to have them double the width of your window. Style: Rod Pocket Panels. Beautiful Floral. Machine washable. Color: Multi Colors. Made in Pakistan. Made of 100% Cotton. Size: 50" x 84" (127 cm x 213 cm). 100% polyester Textured fabric with Checkers Design. Size 60” X 36” for the Swag and 30” X 36” for the two Tiers. It’s a great touch to your kitchen’s decor. The design and texture of the kitchen curtain is delightful. Rod Pocket or Drapery Rings (not included). Watercolor Field Cotton Curtain Panels. Length: 84 " (213 cm). Contains 2 panels. Each Panel. We try to describe the color exactly as the manufacturer has described it. Artscape films are easily applied to any smooth non-textured surface and DO NOT use adhesives, Artscape films are easily removed if needed. Artscape films provide UV protection and are the perfect decorative accent for windows that require continued privacy. Listing is for 1 Valance. Tapestry valance in multi colors red, blue, orange, gray. Finished size approx. 41"x 11 1/2", 1 1/2" rod pocket, fits up to 30" opening, unlined. Handmade from cotton fabric.` Free fabric sample.contact seller for more information. Color may vary from picture, print lay out varies. If listing is out of stock or listing has ended contact seller for a reserve order. Check out my ebay store for many more styles, patterns and colors! Check full listing for more details! Please contact seller with any questions before purchasing, thank you!. Listing is for one handmade valance. Beach Cottage Stripe valance in blue, green and white stripe....home decor fabric....measures 41"w x 14"l, 1 1/2" standard rod pocket. Read full listing below for more details, follow seller for future visits.....come visit seller's store for more items. 44x96 each drape. Quantity: 2 Drapes. We try our best to resolve any issues as fast as possible. Woven of 100% cotton. DETAILS THAT MATTER. Rod Pocket or Drapery Rings (not included). 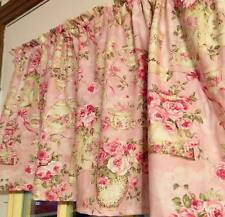 Tossed Floral Cotton Curtain Panels. Length: 84 " (213 cm). Contains 2 panels. Each Panel. We try to describe the color exactly as the manufacturer has described it. Size 60” X 36” for The Swag and 30” X 36” for. Update the appearance of your kitchen with this Kitchen Curtain set. It's a great touch to your kitchen's décor. The embroidery design and texture of the kitchen curtain is delightful. Listing is for 1 Valance. Farm house rooster valance in reds, gray, tan, black, paired with black and white buffalo checked. Finished size approx. 39"x 12", 1 1/2" rod pocket, fits up to 30" opening, unlined. Handmade from cotton fabric.` Free fabric sample.contact seller for more information. Color may vary from picture, print lay out varies. If listing is out of stock or listing has ended contact seller for a reserve order. Check out my ebay store for many more styles, patterns and colors! Check full listing for more details! Please contact seller with any questions before purchasing, thank you!. The valance is 15" long and 42" wide and will fit a window a little less than 30" wide. V alances, curtain panels, toilet seat lid covers, pillowcases, throw pillow covers and guest towels. It has a 1 1/4 ?. After all, she worked in the horticultural field for years before studying painting and art history at Massachusetts College of Art. This cotton-linen curtain is enriched with colorful traces of exotic flora. The unlined window valance is primitive mustard, country red, navy, and green plaid. 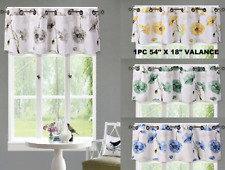 This Park Design valance is from the "South River" collection. The valance is 100% cotton. It is 14" long and 72" wide. This Park Design valance is from the "Scotch Plaid" collection. The valance is 100% cotton. It is 14" long and 72" wide.